I have a confession. Some days I don’t want to be an adult. There are days when I’m just so over everything. I don't even feel guilty for admitting that. My truly uninterrupted "me" time amounts to less than 1 hour a week. There are people (and animals) draped on me at all times. And sometimes, it's simply more than I can handle. Most days I'm happy and positive, and I feel like I CAN do it all. I feel like Supermom. But I'm not afraid to admit that it's not always rainbows and unicorns over here. Those "other" days often sneak up on me. I'm cruising along, feeling like I'm in my mothering groove, when BAM...it hits me. I suddenly realize that I can't take much more and I'm going to snap if I don't do something soon. I'm sure many moms know exactly what I'm talking about. It's one of those days when I’m so over dropping kids off, picking kids up, and waiting around during their many activities. One of those days when I couldn’t possibly sit behind the wheel of my car for one more second. One of those days when I’m tired of wiping butts, preparing food, and cleaning up all the messes. One of those days when I don't want to clean or handle one more responsibility. One of those days when the noise level and constant chaos in my home is driving me batty. And most of all, one of those days when I just don’t want to be touched. One of those days when I want to scream "JUST STOP TOUCHING ME!" I don't really mean it, of course. I know how blessed I am, and I am so thankful for the gift of motherhood. But all moms have these moments. We can't do it all, and when we do, it's only a matter of time before we burn out. We’re on call 24/7 and rarely get a break, and after a while, it takes a toll. Don’t get me wrong. I absolutely love my kids and wouldn’t trade them for anything, but every so often I just need an hour to myself. Sometimes...just sometimes...I have to cheat on motherhood, marriage, and adulthood, and do something for myself. Sometimes I need to forget that I'm a wife and a mother. Sometimes I need to pretend that I'm not actually an adult with many important things to do. Ideally, that would be leaving for a night out with friends or a run at the park. But I can’t really leave my house while it’s full of kids, so I have to get creative with my me time! So I “cheat” on my family and escape adulthood for a little while, in my own home. STEP TWO: Conveniently tuck my iPad under my arm, and make a run for the bathroom. STEP THREE: Lock the door. This step is crucial. STEP ONE: Notice the mountain of dishes that need to be washed and the empty lunch bags sitting on the counter. STEP TWO: Let out an extremely audible sigh and announce loudly that these dreaded chores are going to take forever. STEP THREE: Shoo the entire family out of the kitchen. STEP FOUR: Set up the iPad, turn on Netflix and get to work! STEP TWO: Stomp down to the laundry room with the iPad tucked safely between layers of clothing. STEP THREE: Let go of all worries. As soon as husbands and kids hear the word laundry, they avoid it like the plague. STEP ONE: Scream “I JUST NEED SOME TIME ALONE!” at your husband, with that crazed look in your eyes. STEP TWO: Stomp out of the house with all the essentials. You know...a drink, a snack and a mobile device. STEP THREE: Climb into your car and LOCK THE DOORS. STEP ONE: Set a new rule. Late Friday nights are my binge watching night and everybody in my family knows it. After a super long week of being on the go non-stop, I just need to unwind! STEP TWO: Put on your comfiest pajamas, put Netflix on the TV, turn off the lights and curl up in bed. STEP THREE: Choose a show (NCIS is how I roll) and start binge watching it from the beginning. Just keep watching until you fall asleep in all your exhausted, drool-covered glory, only to be woken by your husband laughing about how you can't make it through a single episode without falling asleep (not true). No shame. No shame. Even if it does take two nights to make it through one episode. Just to set the record straight, this doesn't happen often. My TV/Netflix watching is minimal. I'm one of those weird people who hates to have the TV on all day, so I have a No TV until evening rule. But sometimes I just need to relax and lose myself in a show! In case you’re wondering, here’s what *I* think you need to be watching on Netflix right now! *The Crown - Incredibly well acted and it will leave you wanting more! *Cuckoo - A British Comedy that keeps us laughing! *House of Cards - One of my all time favorite shows. I could watch it on repeat! *Peaky Blinders - A bit too violent, but it has a fantastic story line and even more fantastic eye candy. Ahem...did I actually admit that? *Santa Clarita Diet - This Zombie comedy is absolutely hilarious! I didn't think I would like it, but I couldn't stop laughing! *Gilmore Girls - If you missed that train, get on it now! There's a reason why I've watched the entire series five times through! *NCIS - There's a reason it has a million seasons. I'm hooked! Do you ever "cheat" on motherhood? What are YOU watching on Netflix right now? DISCLAIMER: I am a member of the Netflix StreamTeam. 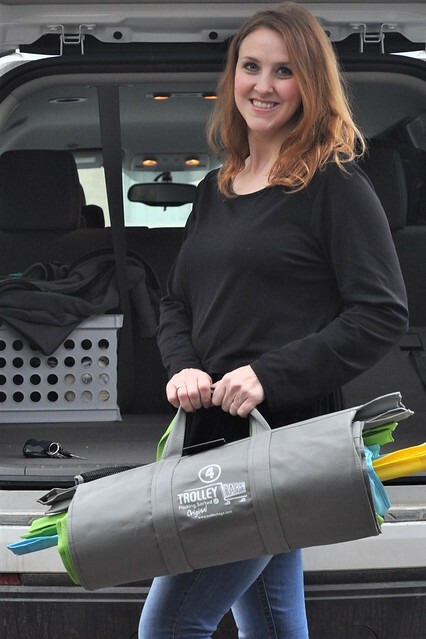 I receive service and other promotional products in exchange for my monthly review. All opinions are 100% my own. During Winter and Spring, I know there are going to be many days when we are cooped up indoors, thanks to the cold or the rain. 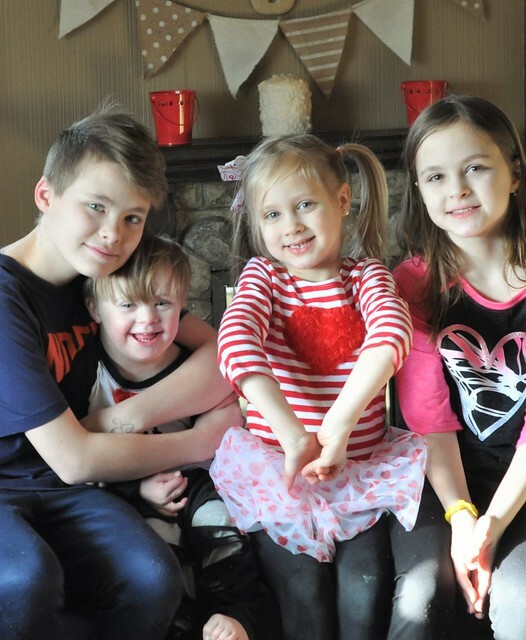 With four kids, cabin fever can set in very quickly! 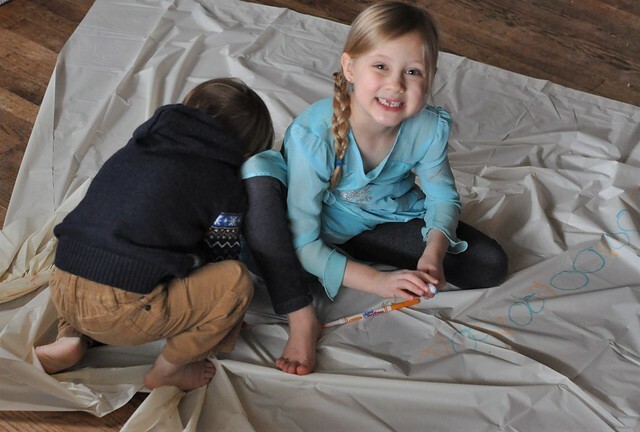 An arsenal of indoor play ideas is essential for this mama's survival! Every parent knows that kids get bored very easily. 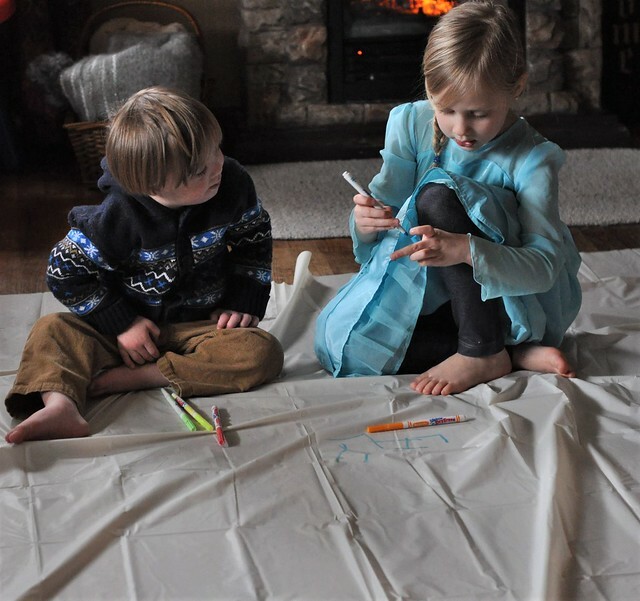 My kids definitely have favorite indoor activities that they always turn to, but after days of bad weather, they quickly tire of those activities. I'm constantly brainstorming new ideas that will continue to keep my little tribe entertained! This is a fun idea that we have been doing for many years! 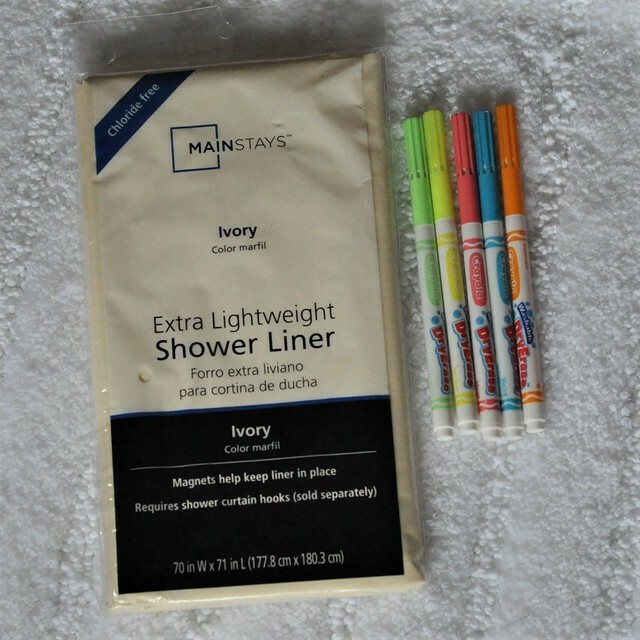 The only supplies needed are a cheap plastic shower curtain (you can buy one for under $2 at Walmart) and dry erase markers. 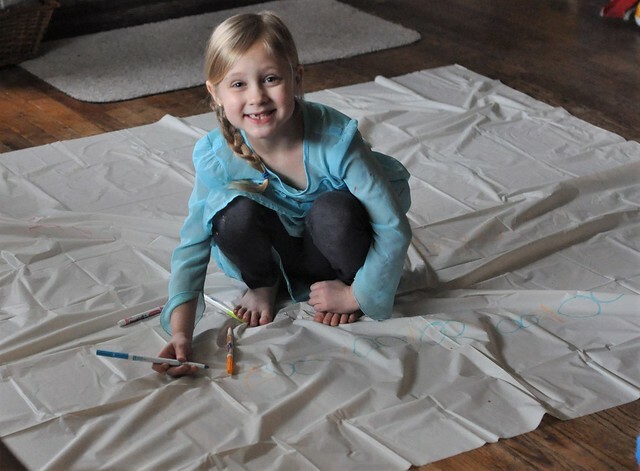 Spread the shower curtain out on the floor, give the kids some dry erase markers, and let them decorate it! This activity always keeps them busy for a long while! When they are done, simply wipe off the shower curtain with a wet wash cloth, allow to air dry, then fold up and store away for the next use. 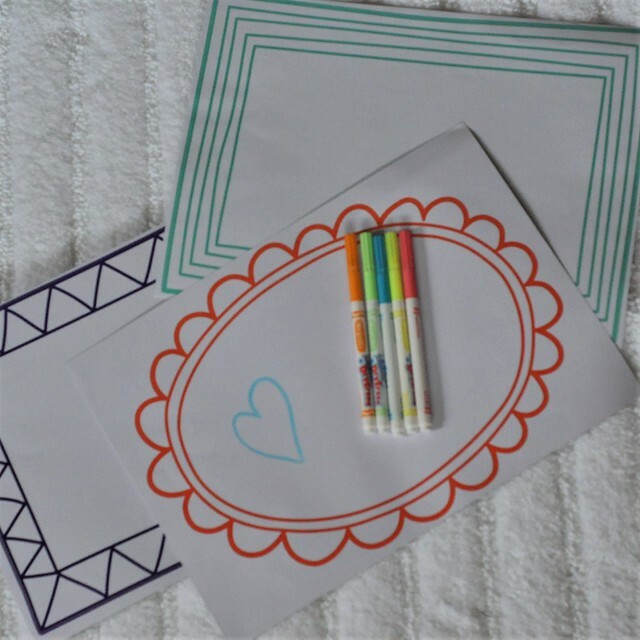 This is also a fun idea for a coloring table at a party. We also keep one on our art table at all times, and my kids decorate it with permanent marker while they are creating! I originally found road wall decals on Amazon, but I recently found some in the Target Dollar Spot. 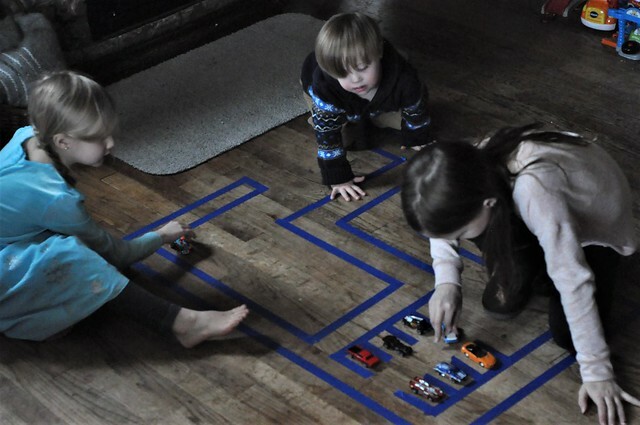 I don't know what the appeal is, but for some reason, the kids seem to love to push their cars on the wall track! 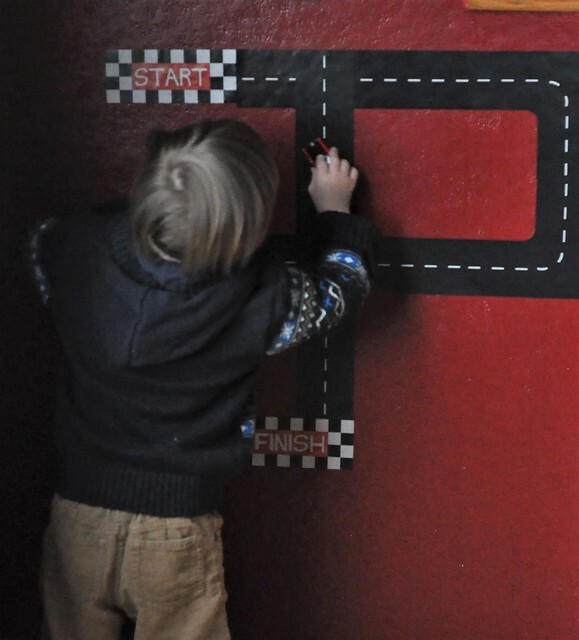 I do replace them every few weeks, and I move the wall track from room to room to encourage play in other areas of our home. 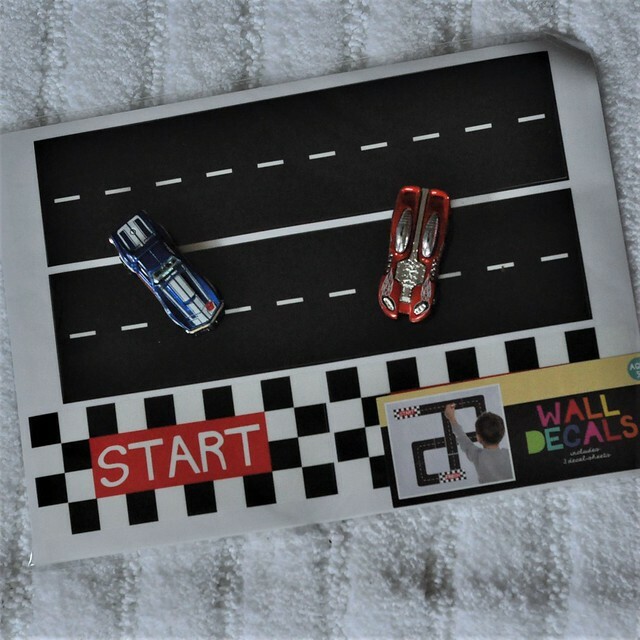 These wall decals also work great on the floor, or stuck to a table top! 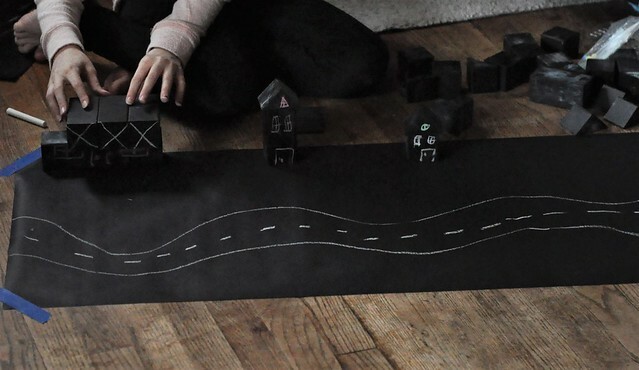 Purchase an inexpensive roll of chalkboard paper and a box of chalk, and your kids will have hours of fun! 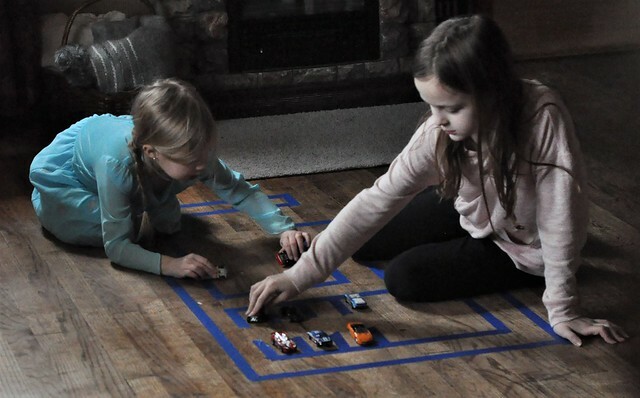 Roll it out on the table for Tic Tac Toe, Hangman and drawing, or roll it out on the floor and tape it down with painter's tape. Kids love drawing towns and landscapes! 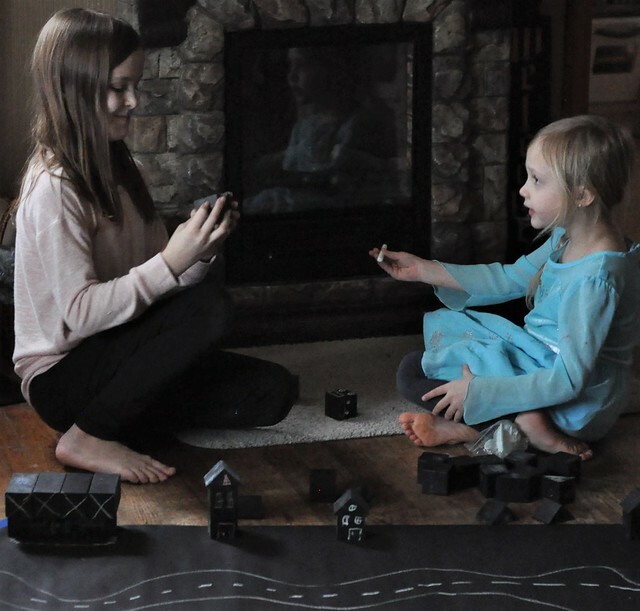 Bonus points if you have chalkboard blocks to put in the "town!" 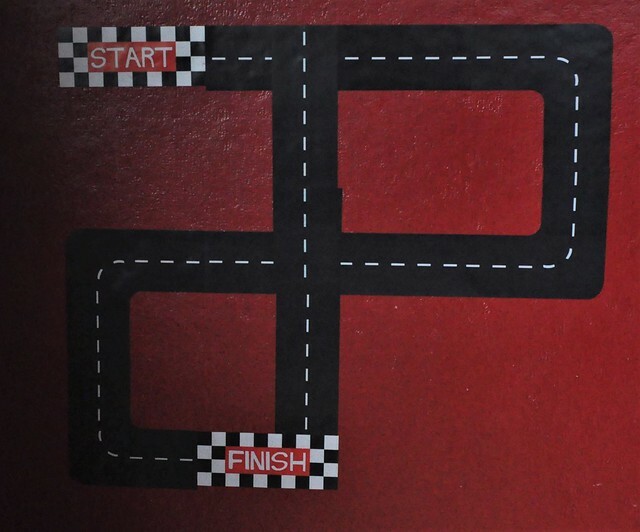 Similar to the road decals, dry erase blank canvas decals can provide hours of fun! 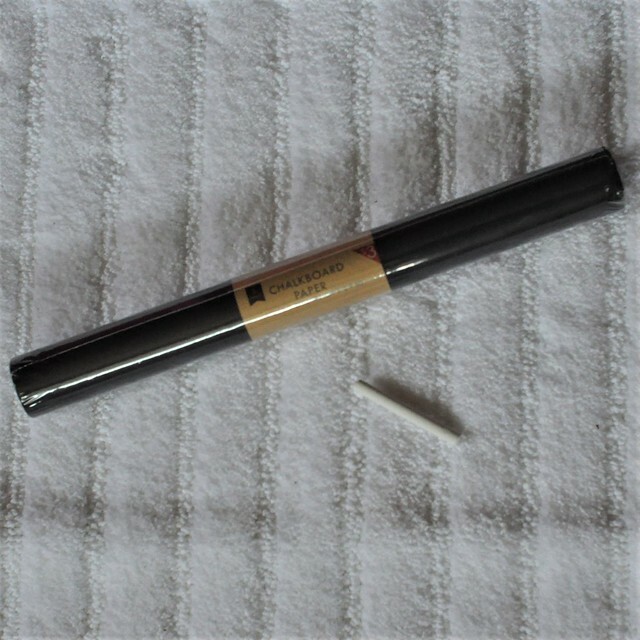 Find them online, or, if you're lucky, you will be able to find some in the Target Dollar Spot! 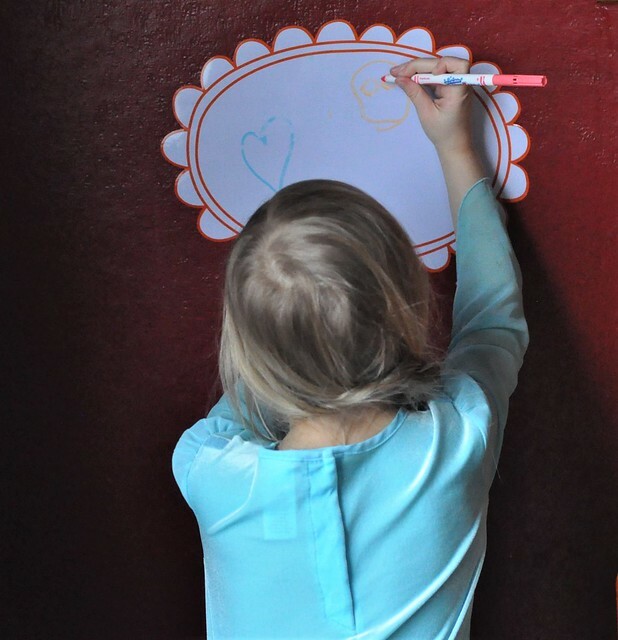 Simply peel and stick to the wall, and let the kids decorate them with dry erase markers. They wipe clean after every use. 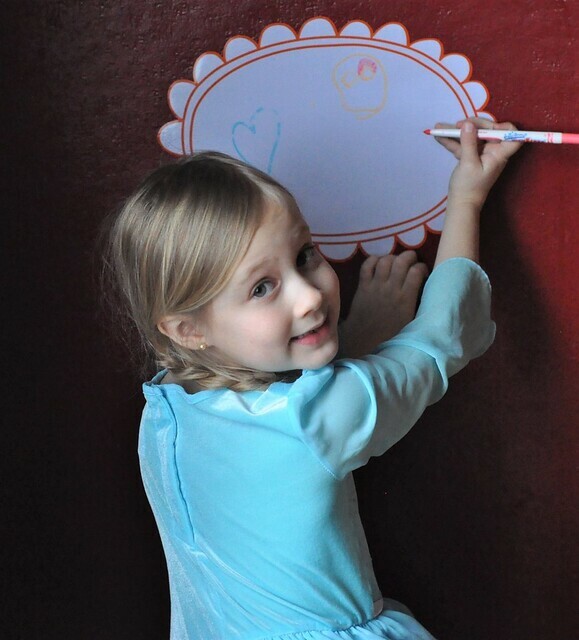 My kids LOVE drawing and writing on these! 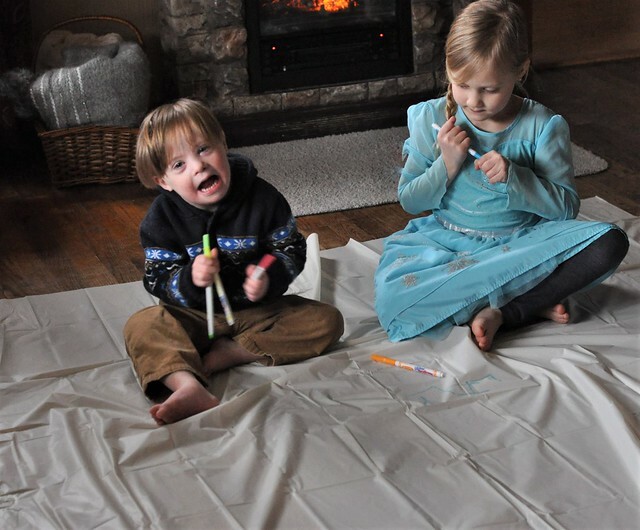 They're also great for practicing writing letters, numbers and sight words! 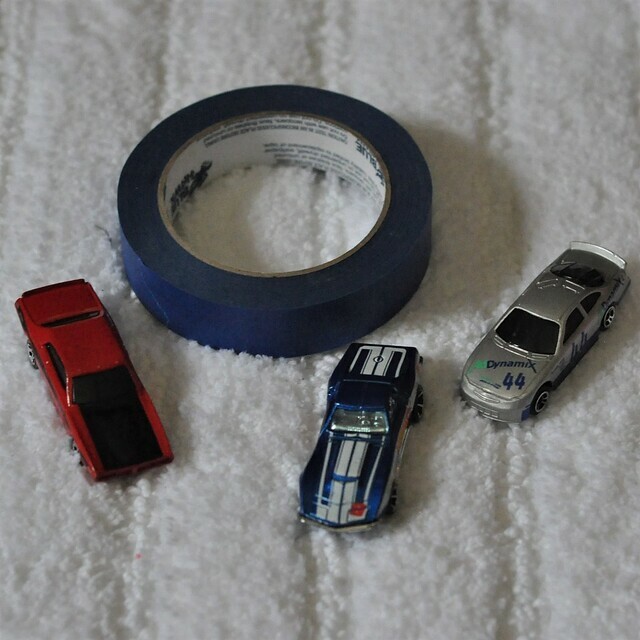 One roll of painters tape = hours of fun! 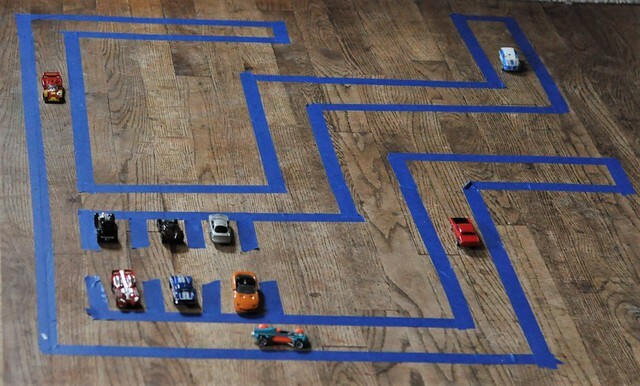 Peel off strips of tape and stick it to your floor to create mazes, roads or hopscotch boards! Today, we made a road and a parking garage. 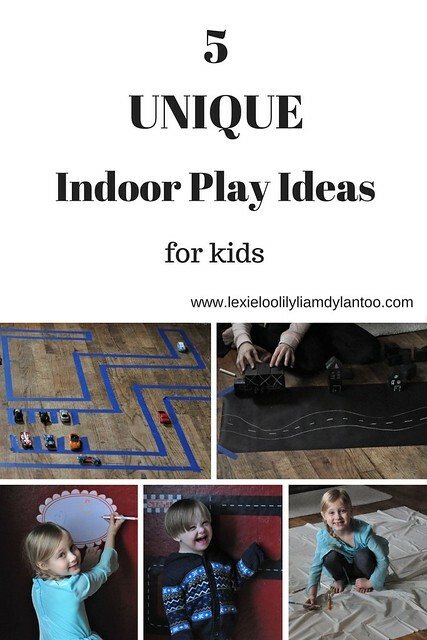 These are just a few of the indoor play ideas that I always have on hand for cold or rainy days! It definitely helps to be prepared! 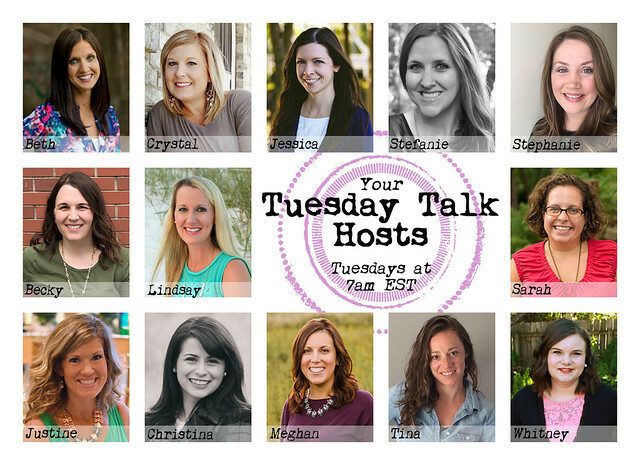 Join us for Tuesday Talk! Grab this button and link up any of your posts below! Happy Monday! It's always so tough to return to reality after the weekend, but I'm trying to stay positive. I'm sure caffeine will help! It has been a while since I wrote about life lately, so I figured it was time for an update on me and my family! It's so easy to get into the routine of just sharing Pinterest-worthy ideas and sponsored content, but I never want to forget the reason I started this blog 8 1/2 years ago: to share my family. I can always tell when I need to get personal on my blog and reconnect with my readers, and now's that time. Life has been busier than ever the past few months. The older my kids get, the busier I get. There's never a break, and there's never a dull moment! This little space has been quieter than ever before. It was partially due to our constant busyness, and partially due to some other blog projects that are coming up, but it was also because I was sick for a month...literally, a full month. Despite the mild winter, we have just been passing around every possible ailment, and I got the worst of it. I'm still not 100%, but I'm getting there! Here's a little peek at life lately for my family! Well, you already know that I've been sick for four weeks and pretty much living in my car! All I do is pick kids up, drop kids off, drive kids to activities and playdates, and wait for them while they are doing said activities. As for my month-long illness streak, I probably should have gone to the doctor, but a) I'm stubborn and b) no time! Other than a very annoying lingering cough that remains, I managed to kick it by actually going to bed instead of staying up all night writing, taking vitamin c, soaking in the tub (which allowed me to read more often), and drinking my weight in hot tea every day. I'm still taking a ton of pictures (not surprising), including some for family and friends, and I'm getting ready to upgrade my camera. I've owned my beloved Nikon D90 since Lexie was 1, which means I've had it for 9 years. I spent a lot of money on it back then, and I definitely got my money's worth, but it's time for something new. That means that I've been stressing over it for weeks and still haven't made a decision, just like I do with any major purchase. 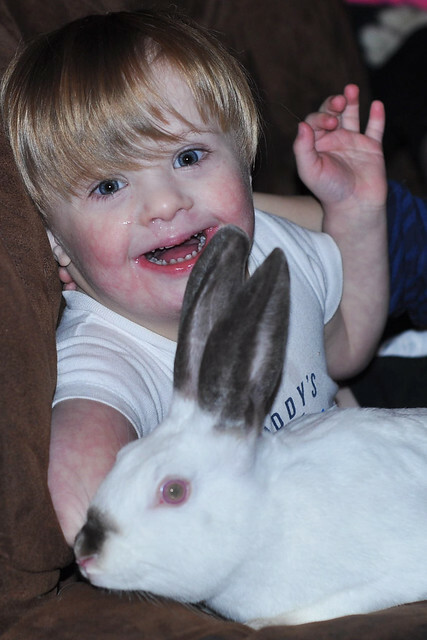 I still volunteer for the Down Syndrome Diagnosis Network every day, which I absolutely love. I run their Instagram account. It only takes about 20-30 minutes each day, and it's so rewarding. I love seeing all those beautiful faces every day and helping out parents who are seeking help after a diagnosis. As for this blog, things are going to be picking up here again, and I'm excited! Sometimes a little break can be refreshing. I have so many fun posts in the works. I also just finished up a few final drafts for some really awesome collaborations that are coming up. You can also find me posting on Pittsburgh Moms Blog, which is part of the City Moms Blog Network. Stay tuned for more! You won't see Grant on here very often. He prefers to live in the moment and stay behind the scenes, and I respect that! Plus, he's at work or thinking about work ALL THE TIME. He got a big promotion in the Fall, and he works 45 minutes away, so the days are long for him (and for me). He is able to work from home more often, so it's fun to have him around during the week on occasion. In his rare free time, he plays his guitar. He's quite good, and is starting to record more videos. It's a fun hobby for him! Dylan has been busy with school, band, orchestra and basketball. It's a lot to juggle! I still can't believe that he will be in junior high and turn 13 in the Fall! 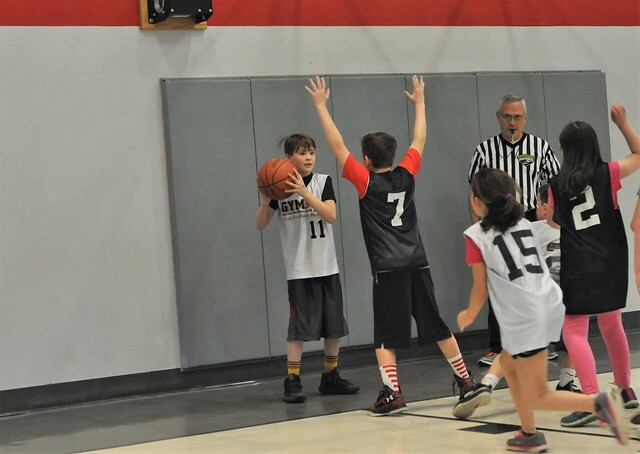 He just finished this season of basketball on Saturday. It was his second year playing and he's really good! He definitely found his sport. The improvement from last year to this year was HUGE. He rocked the last few games and scored a ton of points. He loves playing, and I can't wait to see where he goes with it. We're definitely going to miss cheering for him every Saturday morning. I never thought I would love watching basketball, but I really do! And this kids has talent! I'm not quite sure Dylan is going to stick with playing the trumpet and violin, but I'm really glad he gave it a shot. He will obviously finish the year, but he's undecided about next year. He said that if he does anything, it will be orchestra. Because life isn't all rainbows and unicorns, and I'm not afraid to share the not so good moments, I will say that he is testing his boundaries. 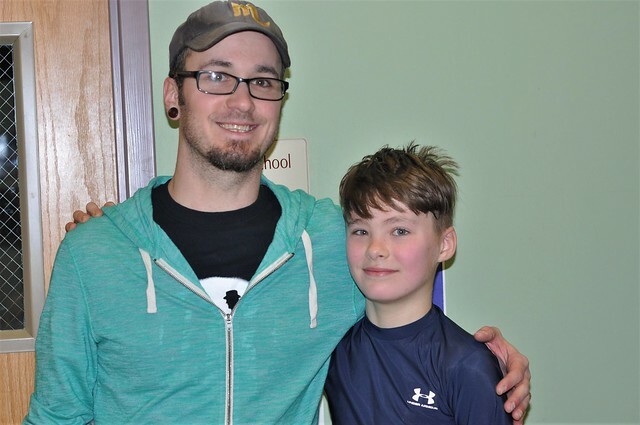 Recently, there were a few incidences of him not turning in homework. iPod privileges were lost and it sparked a long conversation about how important maintaining good grades is. These tween years are tough! Oh, and did I mention he has a girlfriend? They have been together since the beginning of the school year. 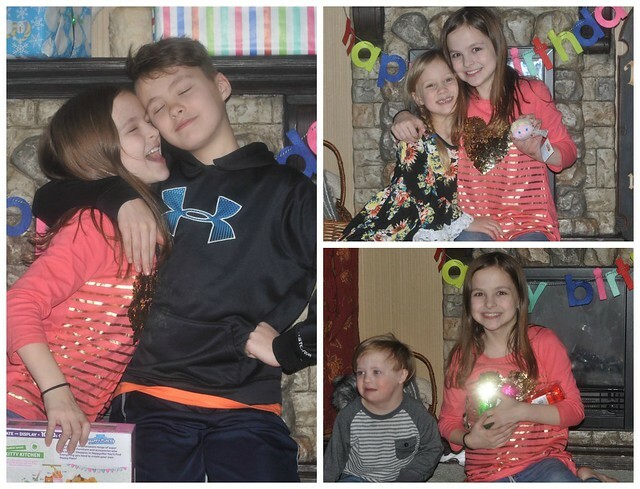 They only had two (supervised) dates, but they gave little gifts to each other on Valentine's Day. It was ridiculously cute! My sweet Lexie Bean turned 10 on Wednesday! She is such a beautiful girl, inside and out. Lexie is my perfectionist and she always aims to please. She loves school, she effortlessly gets good grades, and she is so kind to everyone. Lexie still takes hip hop once a week. She just dances for recreation, but she really enjoys it. She really wants to start cheer this year, so it's good practice for her! Lexie stays after school once a week for choir. She loves to sing, so she is loving it! And next year, I will be handing down my flute, and she will join band, too. A few weeks ago, I gave Lexie my first DSLR. She really has a gift for photography. 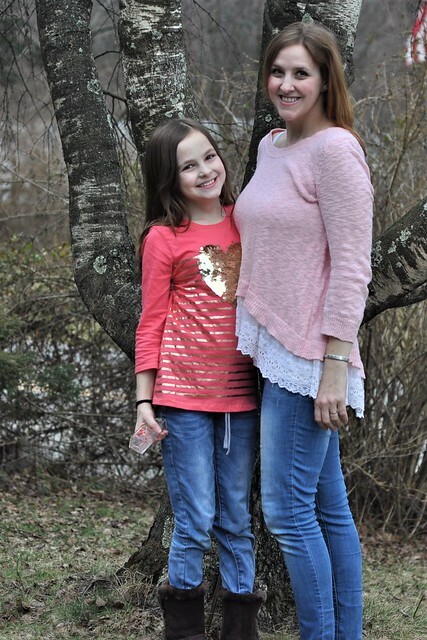 Almost every picture I post of me or of me and one of my kids was taken by her. She was so excited when I gave it to her and wrote on one of her school papers that her favorite memory was when I gave her my old camera. She is the sweetest kid! She is full of so much goodness and kindness, and I am so proud of her! Ah, my sassy little Lily Bug! She is a character. Seriously, she makes us laugh constantly! Lily is in her second half of Kindergarten. We weren't sure if we were going to send her or not, but I'm glad we did. She definitely loves it! She struggles a bit more with reading than some of the other kids in her class, but quite a few of them are a full year older than her. We're spending lots of time working on sight words and reading books, and I have no doubt that she will catch on. She improves each day! Lily attends StoryTime at our local library once a week. She has been attending since she was 3, and it's one of her favorite parts of her week. She is going to be so bummed when she turns 6 and is too old for the program! Lily started dance this year. She takes ballet, tap, jazz and acro. 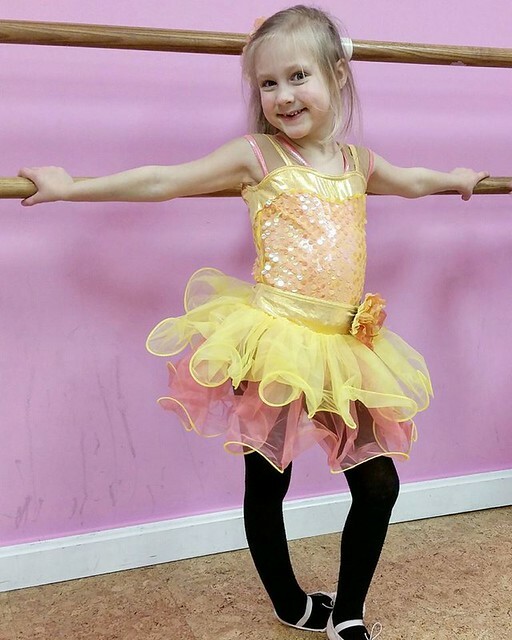 She absolutely loves to dance and has so much fun in her class each week. I have a feeling that more dancing is in her future! My sweet boy had to adjust to so many big changes this year, but he is thriving! He goes to preschool three afternoons a week, and he loves it. We love his school, too. He gets all of this weekly therapy there and he brings home so many cute crafts! 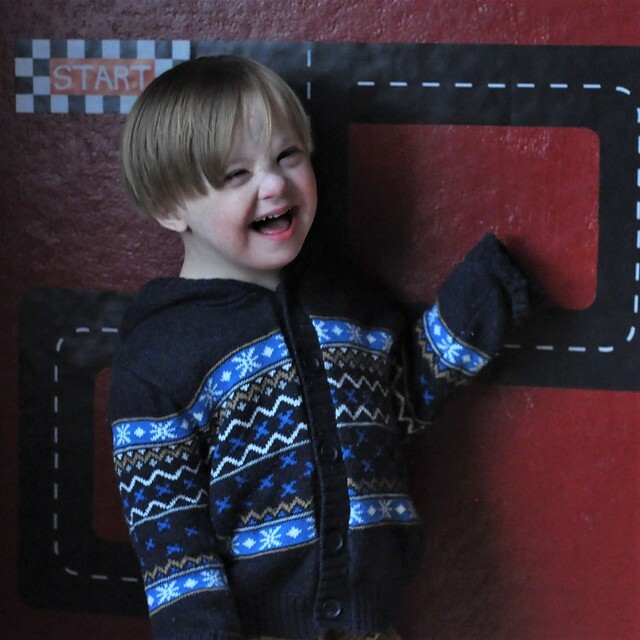 Liam may have Down syndrome, but his delays aren't significant. Perhaps one day I will share more of his story, and explain what his doctors believe, and why we'll never know for sure about their theory. I know it's vague, but I will save that much longer story for another day. His biggest struggle is speech, but his vocabulary is exploding and he's using so many more words! Our biggest news is that he's finally getting the hang of potty training! He knew what it was but couldn't make the connection between the feeling of having to go and making it to the potty. The past two days, he went into the bathroom by himself, took off his pants, climbed on the potty, and peed. We are THRILLED! 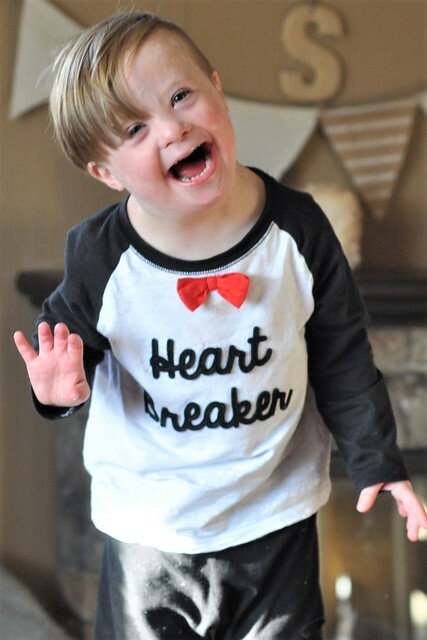 In just a few weeks, we will celebrate World Down Syndrome Day in honor of this adorable little dude. He is a joy and a blessing! There are always a few updates that don't quite fit with one particular family member! 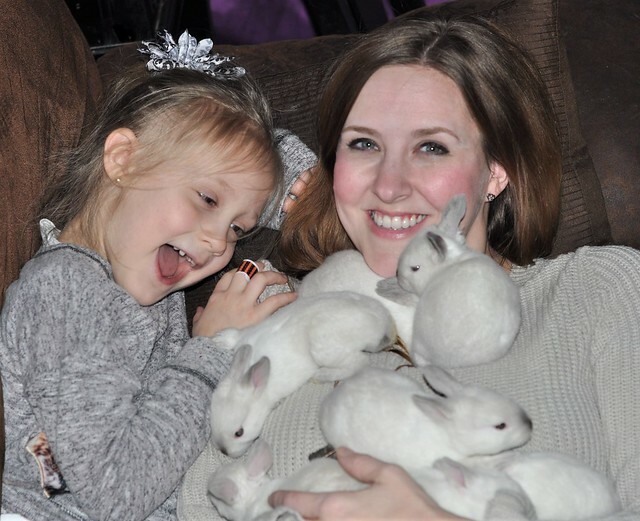 As many of you know, we accidentally welcomed a bunch of baby bunnies into our family. It was quite ironic and slightly hilarious, but we are loving watching our babies grow! 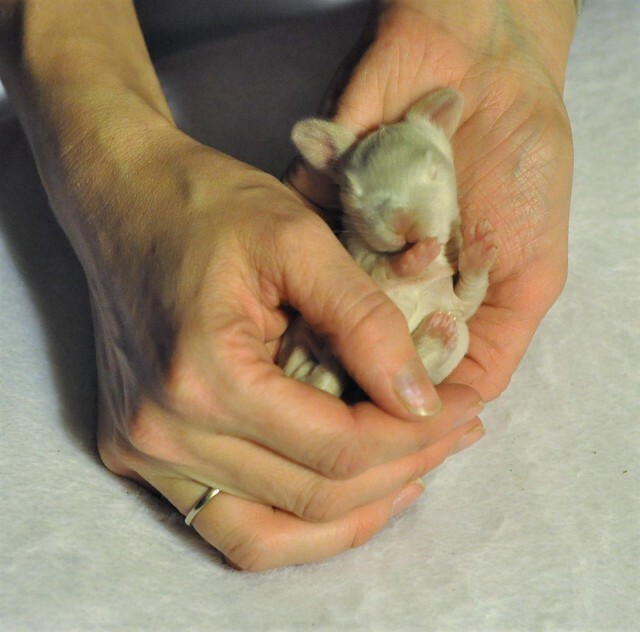 Their eyes actually opened on Lexie's Birthday on Wednesday, and yesterday they turned two weeks old. 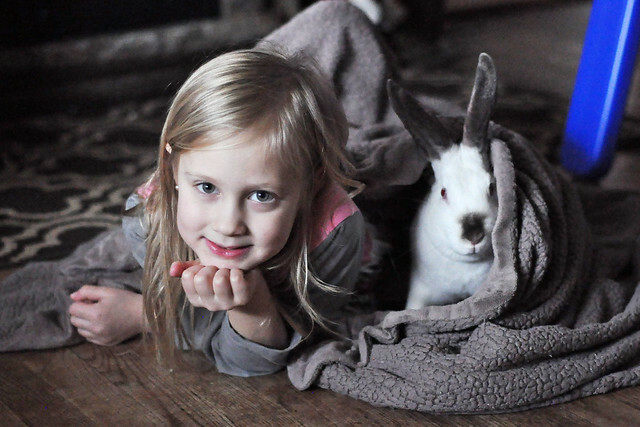 Our entire family is in love with them, but we obviously can't keep 9 pet bunnies in our home. It's going to be so hard to give them away, but we do have forever homes lined up for most of them. We did make the decision to keep one for Lily, and that one will be kept separate until we know for sure what gender it is! Once our babies are grown and at their new homes, we're going to discuss getting a dog. We have been dog-free since our beloved Great Dane passed away two years ago, but my kids are begging for a dog. I can't commit, because I really want another giant breed, but my husband says no way. If we get a dog, it has to be small. We'll see what happens! Finally, vacation planning is in full swing. We're trying to figure out what beach we are going to this year and when. Our usual vacation week is out because our kids are starting school a week earlier than usual, and it falls right in the middle of our usual week. We are definitely bummed about that one, but we're just going to have to go one week earlier. Either way, we're super excited about another week at the beach! 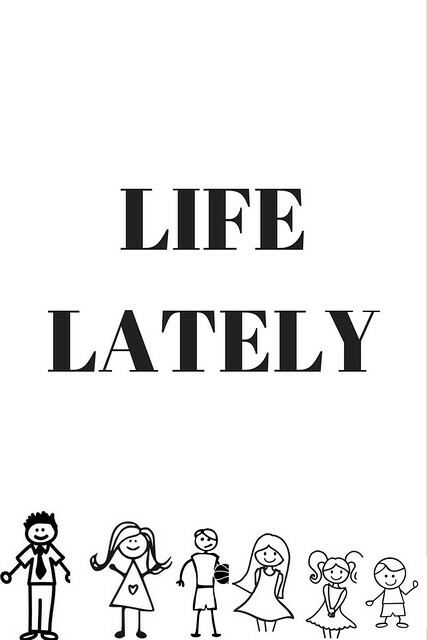 That's our relatively quick version of life lately! We're certainly overly busy, but definitely blessed! Double Digits!!! 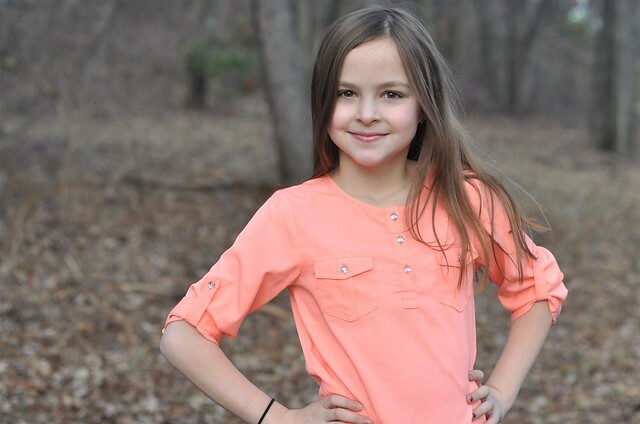 Happy 10th Birthday, Lexie! Well, it happened. No matter how hard I tried, I couldn't slow down time. 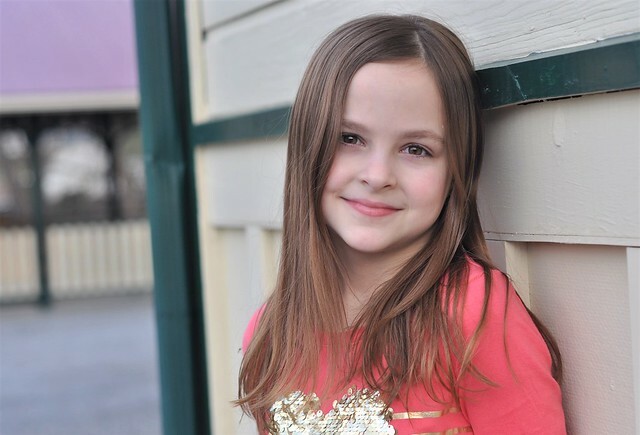 At 4:16 PM, my sweet Alexandria hit double digits! 10th Birthdays are a big milestone. I mean, two whole hands old. An entire decade! I can hardly believe it. It seems like I was just reaching out to hold her for the first time, while weeping tears of joy over the chorus of "It's a GIRL!" that filled the room. Joy is the perfect word to use to describe Lexie. She is incredibly loyal, kind, compassionate, accepting and loving. She is mature well beyond her years and makes me proud every single day. 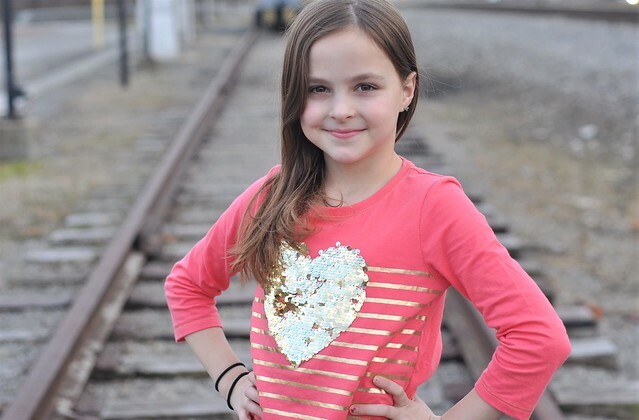 I can't even feel sad about Lexie turning 10, because I am so proud of the beautiful human being she is becoming, and I am honored to watch her grow and call her my own. Today, I wept tears of joy again, because I adore her and I am unbelievably grateful for the gift of her love. 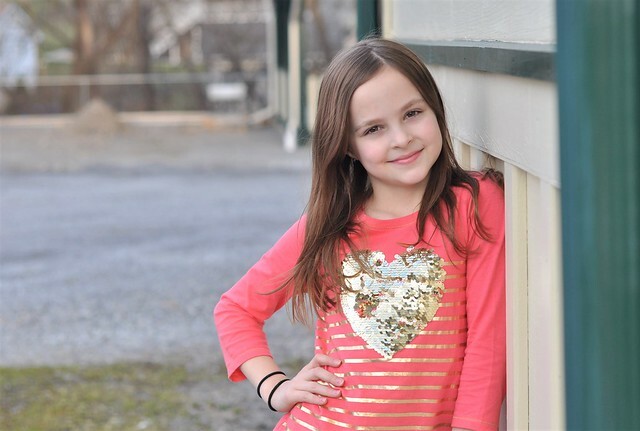 To kick off her 10th year, here are a few pictures from her birthday photoshoot today, her answers to the yearly birthday interview questions and a look at how she celebrated her first double digit birthday! 2. FAVORITE TOY? American Girl Dolls and Shopkins Happy Places. 3. FAVORITE CHARACTER? Spongebob Squarepants! 6. FAVORITE VEGETABLE? Peas and Beans. Anything green, honestly. Except broccoli. Ewww. 8. FAVORITE CEREAL? Mini Wheats, Fruity Pebbles, Lucky Charms and Corn Pops. I can't pick one, but I THINK my favorite has to be Lucky Charms. 9. FAVORITE LUNCH? Build your own pizza lunchables. 10. FAVORITE DINNER? Of course tacos. And poppyseed chicken casserole. And mashed potatoes and gravy. 11. FAVORITE DRINK? Coca Cola and water, but I like water better, because water is healthy.12. FAVORITE SNACK? Snack cakes or Pringles. I just can't pick!13. FAVORITE RESTAURANT? Either Taco Bell or Applebees. 14. FAVORITE TV SHOW? Spongebob, Full House AND Fuller House. 15. FAVORITE MOVIE? Spongebob movies and the new Ghostbusters movie. 16. FAVORITE ACTOR/ACTRESS? The lady who plays Stephanie from Fuller House.17. FAVORITE SONG? House of Gold by Twenty One Pilots.18. FAVORITE SINGER/BAND? Fifth Harmony.19. FAVORITE BOOK? Mercy Watson. It's about a pig. It's really cool. It's like a first grader book, but I still really like it. 20. FAVORITE BOOK SERIES? Babysitters. 21. FAVORITE OUTFIT? A tee shirt with my jeans. 22. FAVORITE GAME? Uno and Pie Face.23. FAVORITE SPORT? I like soccer and I like dancing. 24. FAVORITE ANIMAL? Bunny! I like any rodent, but not guinea pigs.25. FAVORITE PLACE TO GO? Any restaurant. I just want food all day long. 26. FAVORITE THINGS TO DO? Eat, sleep, and watch YouTube.27. FAVORITE SUBJECT? Science.28. FAVORITE STUFFED ANIMAL? BunBun. And Blankie. And Meep. (An alpaca dog toy.)29. FAVORITE DAY OF THE WEEK? Tuesday, Friday and Saturday!30. FAVORITE MONTH? February, July and December. 31. FAVORITE SEASON? Summer and Winter!32. FAVORITE HOLIDAY? Christmas and my birthday. (Me: That's not a holiday.) Yes it is. 33. WHO IS YOUR BEST FRIEND? Sukie! And Aubrey. 34. WHO DO YOU LIKE TO PLAY WITH? Sukie, Aubrey and Lily!35. WHAT MAKES YOU HAPPY? Food and family.36. WHAT SCARES YOU? Dylan's terrifying girl shrieks, spiders and clowns.37. WHAT MAKES YOU SAD? When I don't have food. And death.38. WHAT DO YOU WISH FOR? Mmmmm....I don't know. Actually, a hoverboard.39. WHAT IS YOUR FAVORITE MEMORY? When I got my hatchimal and when I got Bernie the bunny.40. WHAT DO YOU WANT TO BE WHEN YOU GROW UP? A scientist, a teacher, a blogger or a country singer.41. DISLIKES? When Dylan doesn't play with me. 42. WHAT WAS YOUR FAVORITE PART OF YOUR BIRTHDAY? Getting all my presents and seeing family. 43. WHAT WAS THE BEST PART OF BEING 9? Getting Bernie and getting my hatchimal. 44. WHAT DO YOU LOOK FORWARD TO WHILE YOU'RE 10? 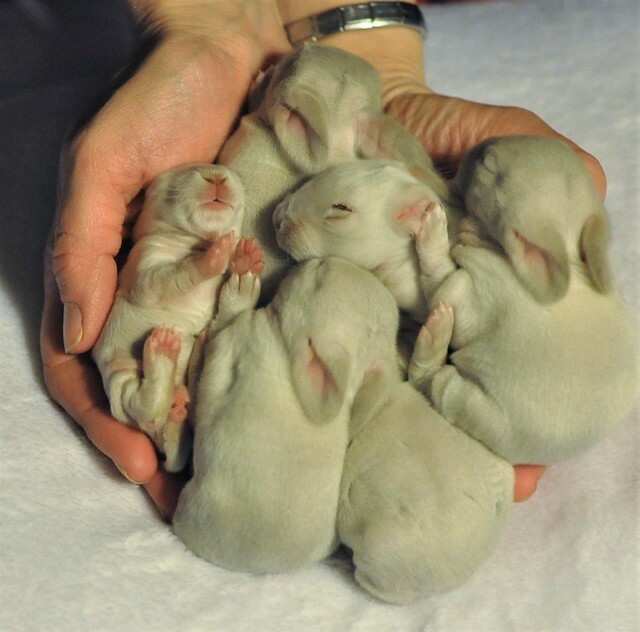 Seeing what our baby bunnies look like when they are older. Some of her answers this year made me laugh! Some things haven't changed much, and she's certainly indecisive. And obviously the kid loves to eat! 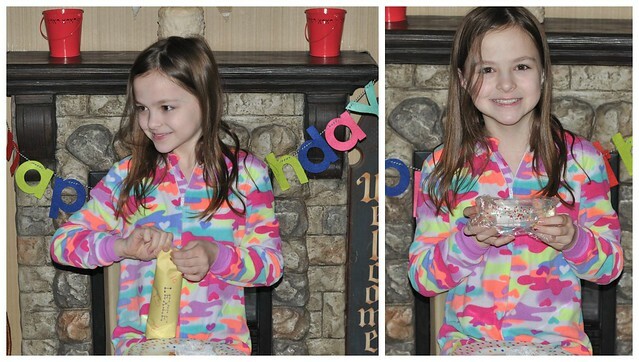 Birthdays are always a big deal in our home! We have a ton of birthday traditions that only add to the magic of childhood. Grant and I know from experience that birthdays aren't as exciting during adulthood, so we try to make them extra special while we can! 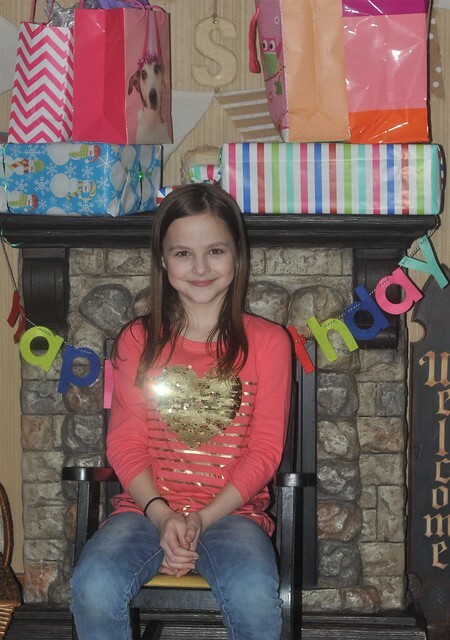 Lexie had an amazing 10th birthday! 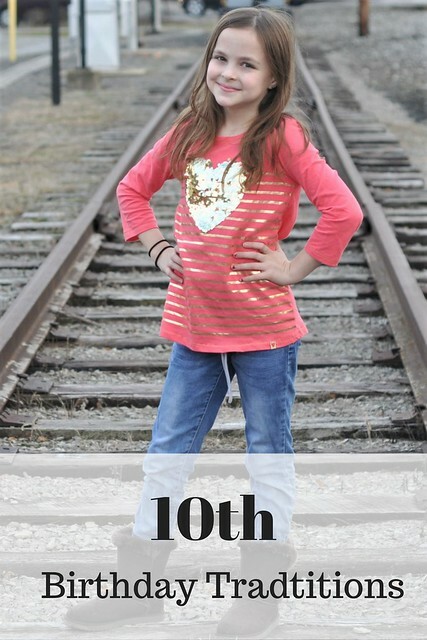 Here's a quick peek at her very first double digit birthday! Birthday traditions start the night before! I always sit out our special Happy Birthday plate and a new candle, and hang up our Happy Birthday banner. A small, wrapped gift is left next to the plate so they can start their day with a present! 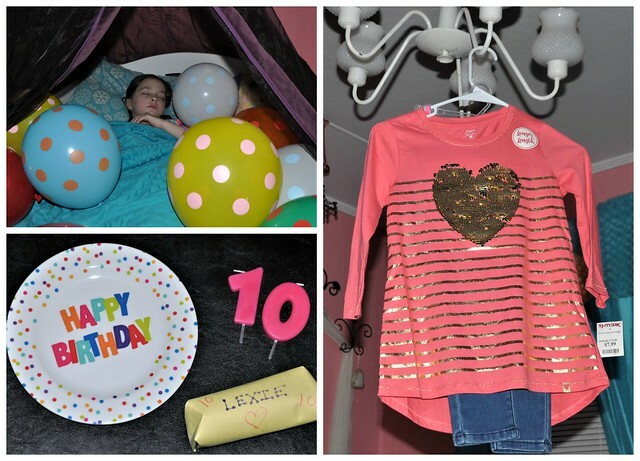 I fill their bed with balloons and hang up a brand new outfit for them to wear on their birthday. I think it all helps to make the day extra special! It was a school day so we were up early this year. I recently gave Dylan the option to skip school on his birthday, but Lexie is a goody two shoes and loves school! She opted to go, despite her free pass! As soon as she woke up, she started her day with the traditional Happy Birthday donut breakfast. After that, she opened her first gift of the day. Lexie only had a few inexpensive items on her birthday wish list and one of them was silicone water tube toys. She was (strangely) thrilled! Lexie put on her new outfit, got on the bus, and spent the next 9 hours at school and after school choir. She got to unwrap another small gift that was in her lunchbox, which is a tradition we recently started. This was the first year I wasn't with her at the moment of her birth. I was a bit bummed about that! It's a sign of just how quickly she's growing up! On the way back from choir, we stopped at one of our favorite photo locations for a mini birthday photoshoot. We had to be quick because we had places to be! Finally, it was time for Lexie's birthday dinner! We let our kids choose the restaurant on their birthdays, and it's always interesting to see what they choose. This year, Lexie decided McDonald's was the birthday spot! She almost chose Applebees, but she really wanted fries and a milkshake! First up were the gifts from her siblings! Liam gave her more water tubes, Lily gave her a stuffed Elsa Tsum Tsum, and Dylan gave her a Shopkins Happy Places set. She loved everything! 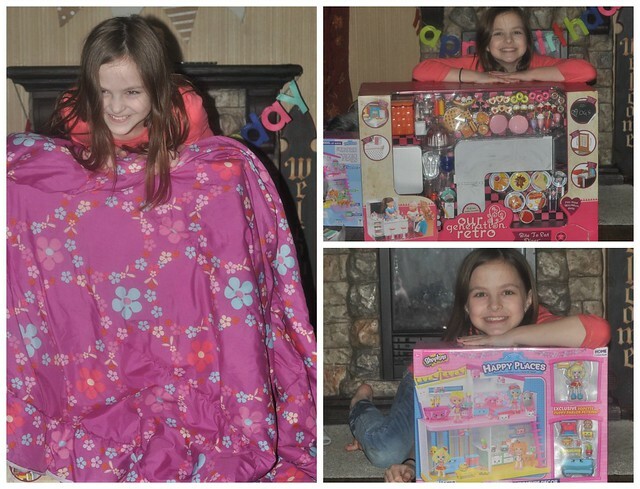 Lexie still loves her American Girl Dolls, so we surprised her with something that wasn't on her list: An American Girl Doll diner! She was SO excited and it was definitely a huge hit! 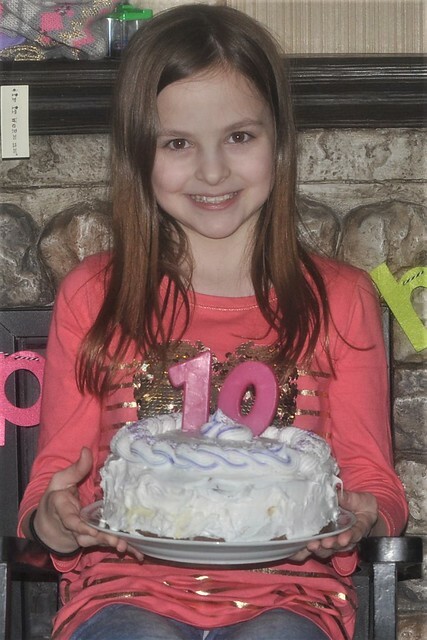 Lexie's 10th Birthday celebration ended with cake. My mom bakes them a cake every year, and this year she filled Lexie's favorite vanilla cake with ice cream! Lexie looked so happy when we sang Happy Birthday! Lexie's first year in the double digits is off to a great start. She was still smiling when she went to bed! 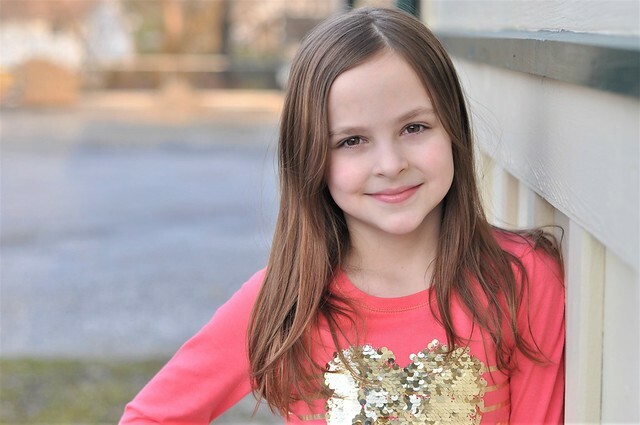 Happy 10th Birthday, Alexandria! You are incredibly special, absolutely stunning inside and out, and you are SO loved! If there's one lesson I learned from parenthood, it's that things NEVER go as planned. Teaching yourself to just expect the unexpected is key. This lesson seems to apply to all aspects of life. Growing up, my family had lots of animals. You name it, we most likely had it! Cats, dogs, rodents, geese, ferrets, rabbits, goats, birds big and small, and even a horse. Thanks to my childhood, I have plenty of experience with animals of all kinds, so we tend to be a bit unconventional and more open minded when it comes to owning pets. When I was a teenager, I had a pet rabbit named Buster who lived indoors, was litter box trained, roamed freely through our house, and pretty much hated everyone but me and one of our cats. They were best friends and could always be found side by side. 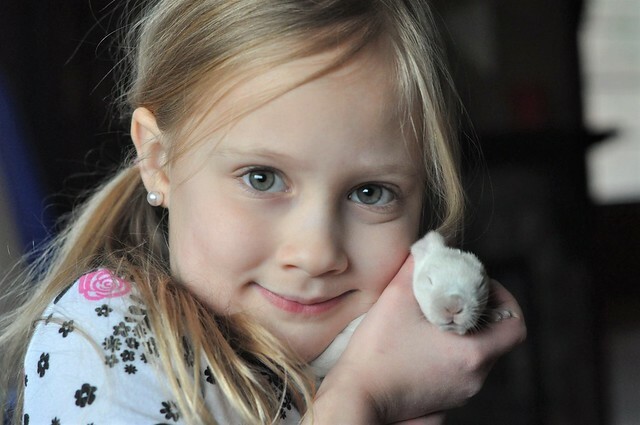 Lexie had been begging for a pet rabbit since she was a young toddler. We always said no because we had a huge Great Dane, but since she passed away, we had been dog free for over a year. When she asked again, we had no reason to say no. 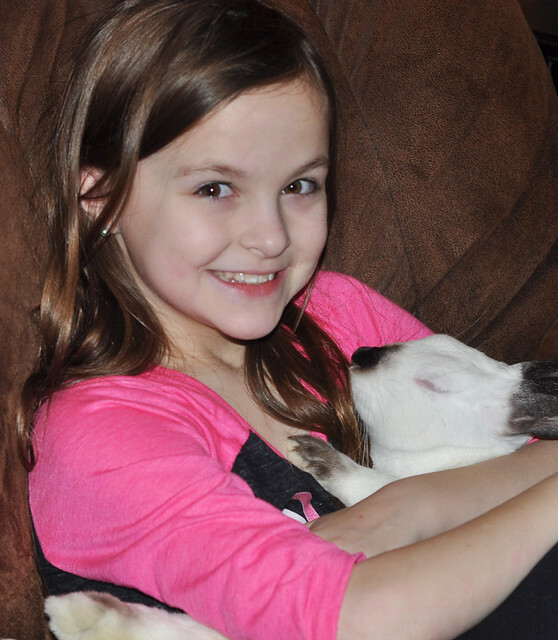 Even my husband agreed, so at the beginning of September, my dad took Lexie and Dylan to a nearby farm to bring home a pet rabbit. Of course, one rabbit turned into two. I even made the joke that they were multiplying like rabbits, but considering they were coming from a farm who raised them for food, we couldn't say no to two rescued babies! And they sure were adorable and sweet. Sure enough, Arctic and Fluffy turned out to be great indoor pets! They are super sweet and friendly, and they love to play with toys. Taking care of them is simple and inexpensive. Yes, they need to be supervised because they do like to chew when they get bored, but we do allow them to hop through our home for a few hours each day. They are both house trained, and they return to their cage to go to the bathroom, then hop back out to play. They really act similar to dogs. My kids adore them! Even though I embrace the unconventional, it's still amusing to walk into a room and see a bunny curled up under a chair or asleep on the couch! But I really am glad we got them. They bring a lot of fun (and excitement...read on) into our home! Here's where things get funny! 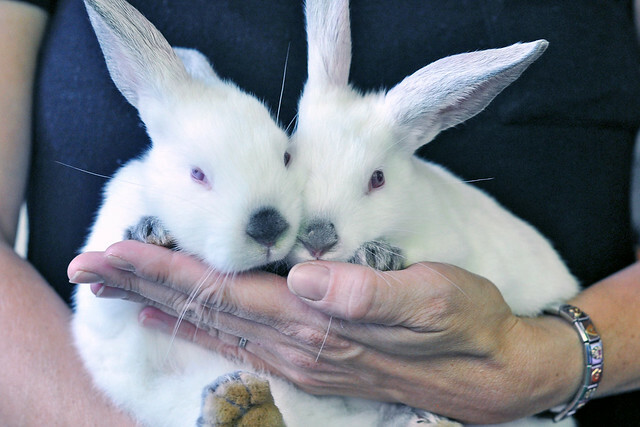 When we got the bunnies, our ONLY stipulation was that they both had to be the same gender. They were checked by a professional, and my husband and I double-and triple-checked. Two girls! Apparently, it's very common for male, ahem, parts, to not show up immediately. This causes male bunnies to look JUST like female bunnies. And sure enough, one day Lexie spotted some questionable parts on her beloved bunny. A bunny that is now named Bernie. We immediately separated our bunnies, until we could get the male fixed, but it was too late. And last Sunday, my kids got a very visual lesson in the incredibly bloody miracle of birth. 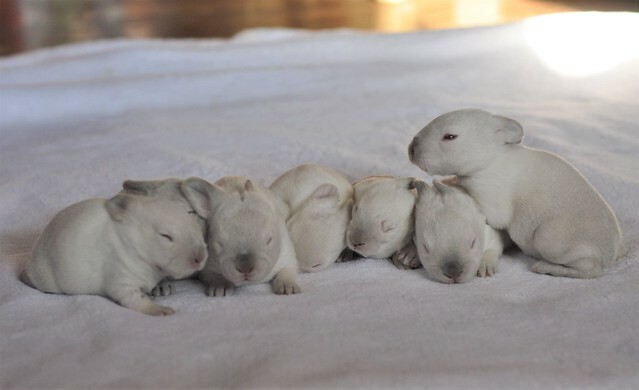 And suddenly our two bunnies became ten bunnies. BOOM. They definitely multiplied. A LOT. Grant and I suddenly had a lot on our plate. We don't have the space to keep ten 10-12 pound pet bunnies, or the money to get all the males fixed (when their parts become visible). However, we don't want to send them back to the farm where their fate is inevitable. After much discussion, we decided to keep one for Lily who had been asking for one of her own for the past few months. Bernie will be neutered next week, and the babies will remain with Arctic for the next 6 weeks. We will find homes for the other babies, and Lily's bunny will move into a separate cage until we know FOR SURE what gender it is, and then get neutered if it's a male. After that, it will move into the cage with its parents. We already found definite homes for two of the bunnies, and we have potential homes for four others. 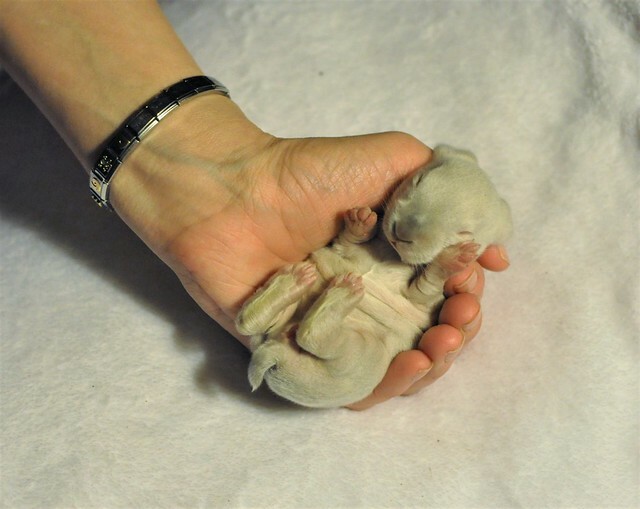 And, unfortunately, one of the babies passed away. We were told it wasn't unusual to lose one or two, but I sure wasn't prepared when I only spotted 7 babies in the cage over the weekend. My heart immediately sunk, and I'm not going to lie: I almost cried when I found one of the babies buried in the bedding. Even my husband looked bummed as he buried it. The babies were thriving so I'm not sure what happened. The vet said it was probably accidentally crushed or suffocated. I know we're not keeping them, but we quickly got attached. My girls were so upset when we told them! 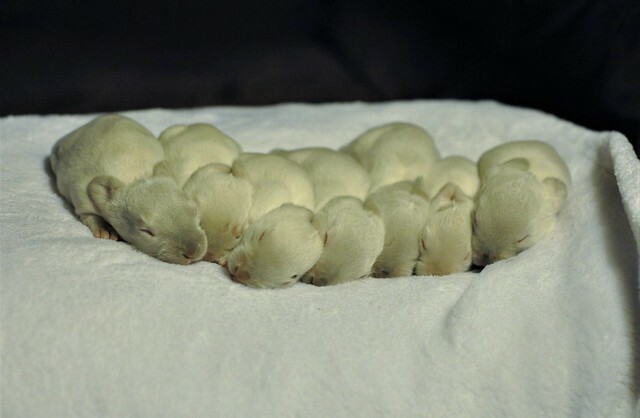 It was definitely a sad moment, but the remaining seven babies are thriving! My kids think it's so cool to be able to watch them grow, and I agree. This will be their only chance to watch every stage of bunny growth. They also get to play a part in raising them by getting them used to (gently) being handled, so they are friendly when they go to their new homes. 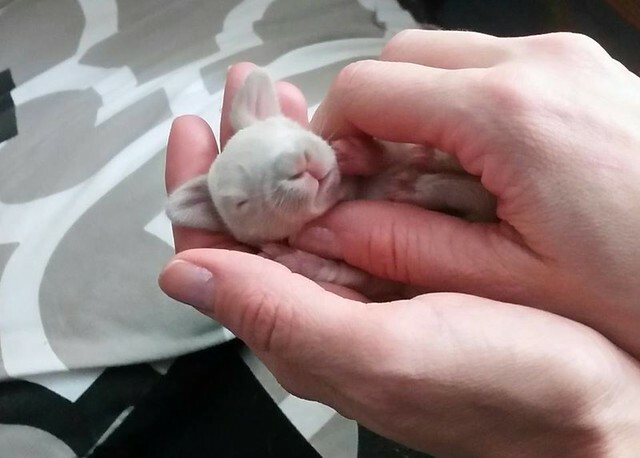 When the bunnies were first born, they were tiny, pink, and completely hairless. 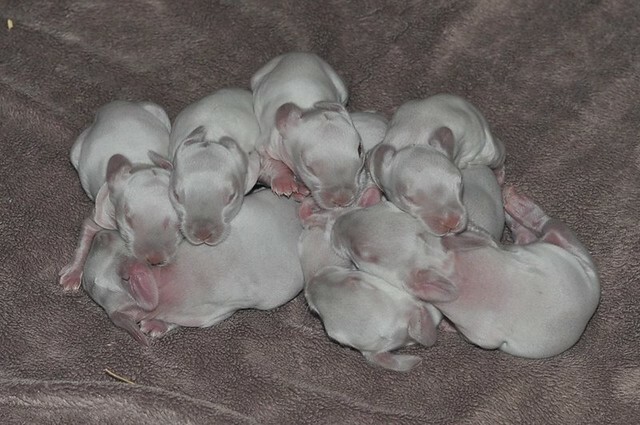 By day 3, they were covered in a fine layer of white fuzz (picture above). 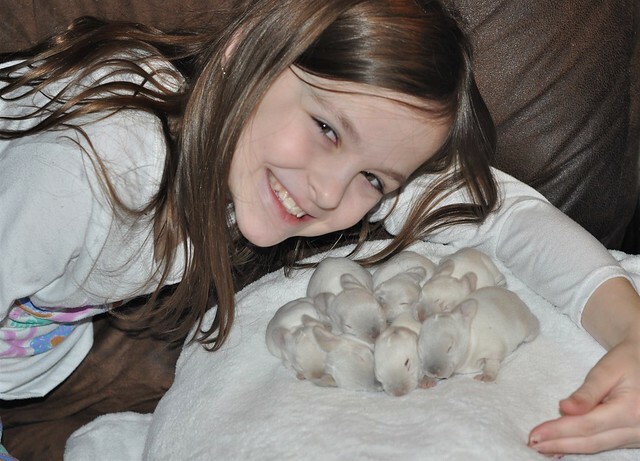 Now, at just over a week old, they have longer hair, their ears are getting bigger, and they are getting chubby. Their eyes haven't opened yet, but that moment is close! And they are REALLY cute! I admit that my immediate reaction was "WHY is this happening?!?" but after four kids, I learned to roll with the punches. Everything always ends up working out, and this will be no different. 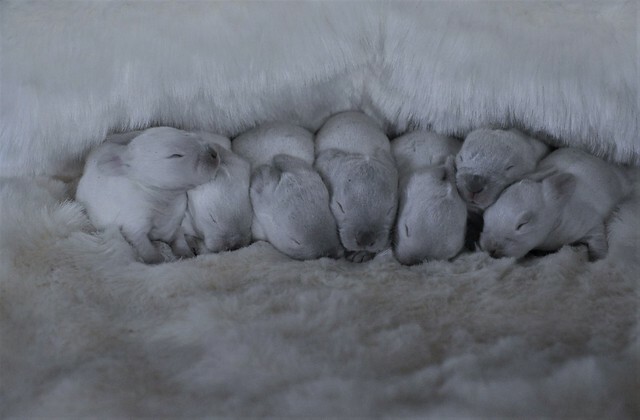 We just have to focus on the positive, and, well, the cuteness of those baby rabbits! It's true that nothing goes as planned. But just like every other curveball thrown our way in life, we figure it out. This time, we're having fun learning in the process! 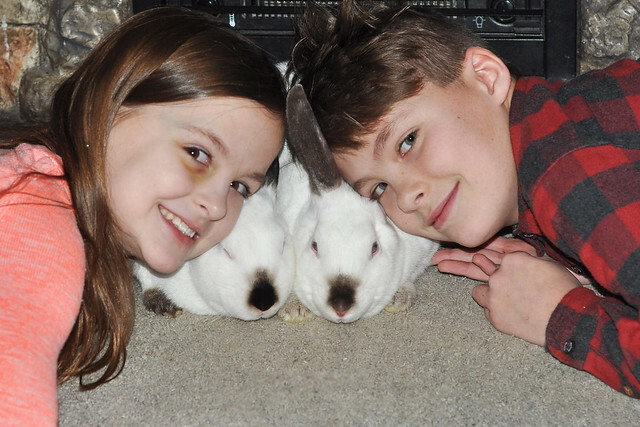 We learned an important lesson in rabbit ownership, and we won't let them multiply again! Join us for Tuesday Talk! Grab the button and link up any post below!